How awesome is this paper ornament! 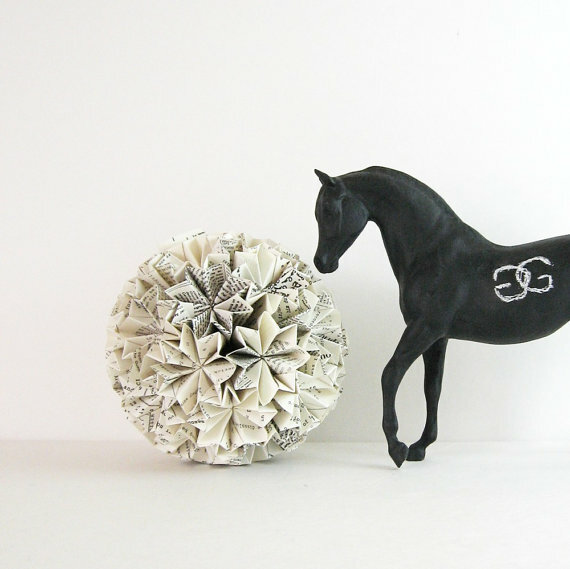 It is constructed of origami stars, folded and stitched together to form a paper ornament. Lovely work by Etsy artist Benjamin Wierel, aka bookBW. It's my favorite thing this Thursday. Paper Source, the store, is one of my favorite place to shop for high quality paper. I used to have one in Boston near me, but since our move to CA, I've been going to the one in Palo Alto. Burlingame will be getting a Paper-Source store, too, though we might move to San Mateo in the meantime. But, it will be close enough, and that means a lot. Anyway, the reason I am mentioning Paper Source, is that sometimes when I'm browsing their products (online and in person), I get inspired to create or re-create something from paper. For example, I will see a pattern I like, whether it's on a paper, or pillow or anything, and then I will try to do something similar in my own way from paper. Case in point, the hedgehog you see here is a direct inspiration of one of their rubber stamps. I made it via paper-piecing technique, and in terms of materials, it's just two shades of card stock (white and shimmer brown) and glue. It is part of my new obsession with paper animals. I have recreated the owl, the turtle, the fox, and I have a few other forest animals in the works. The hedgehog is ready, and as soon as we make the move to a new apartment, it will hang on our wall. A TUTORIAL on how to make a paper carnation. For this flower, I used a pretty double-sided card stock paper from Michael's. It's shimmer yellow on one side and really bright yellow on the other, which is great since it adds an extra layer of depth to the flower when seen from different angles. Same colored papers look lovely, but it would be fun to use a double sided paper, or layer the petals in different colors. See what works best for you. 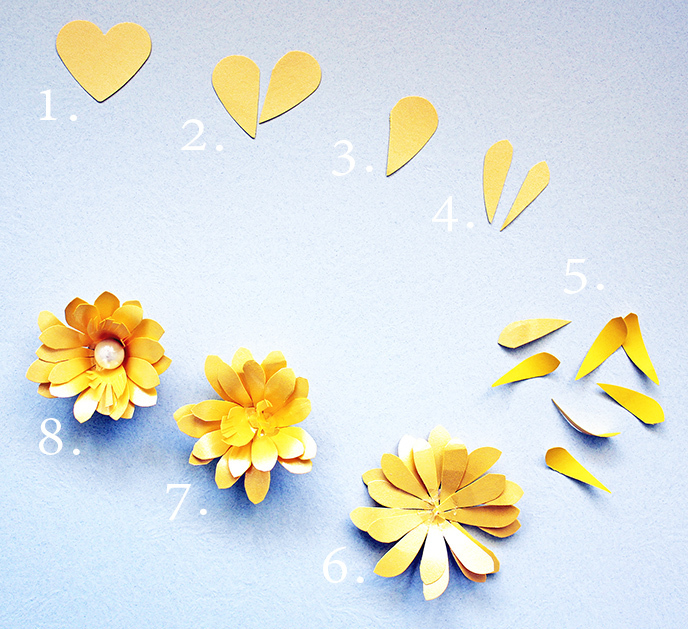 Cut out a paper heart (or use a heart-shaped paper punch if you have one). Cut the heart in half. Cut the half in another half to make the narrow petals. From one paper heart you will get 4 petals. Round the tip of the petals. make the narrow petals. Shape the petals using a chop stick or a thin pencil. Glue the petals on a circle in two layers. Fold the petals upward to shape the flower. Add a pearl or some other embellishment for the center. Or keep it simple with a few more petals that have been fringed and glued to the center. If you have any questions about the making of this flower, please leave me a comment. Also, see my other tutorials for additional flower shapes and such. 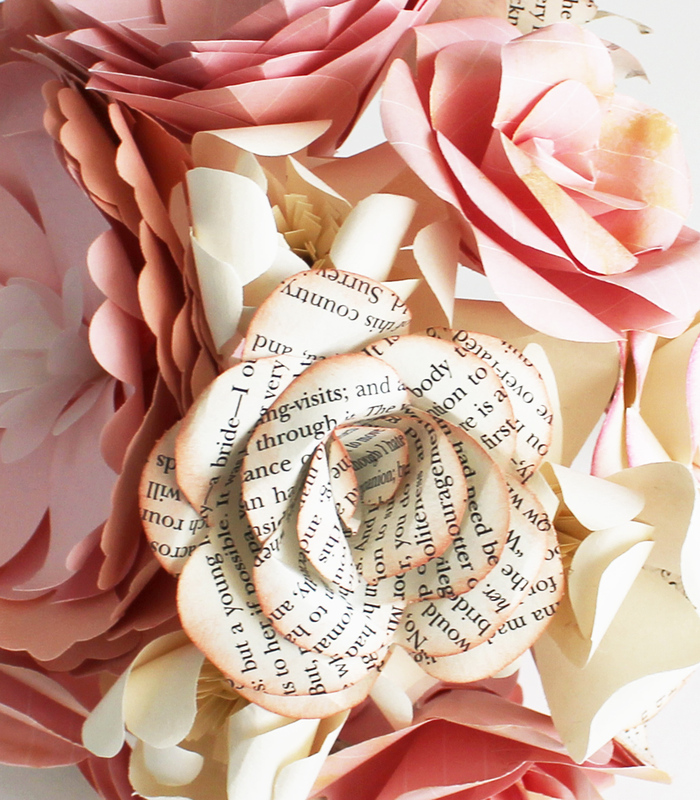 As you may have noticed, I am getting more and more into book-paper flowers lately. They just provide that nice simple look, the base of the bouquet, which can then be perked up with a touch of color or form from other flowers. In this case, I wanted a pastel bouquet, so pale PINK magnolia-style flowers play a big role, as do pale YELLOW flowers, roses in the palest BLUE and tiny paper flowers in different pastel colors. I was toying with the idea of wrapping the bouquet in a dashing mustard satin ribbon or a more traditional ivory satin, but I am leaving that option open for now. The bride that purchases this bouquet will decide which color ribbon to go with. The bouquet (sans the knit vase) can currently be found in my Etsy shop. A book paper rose inked with pale pink ink. It's one of a kind and I made it just for Judy's wedding this fall. 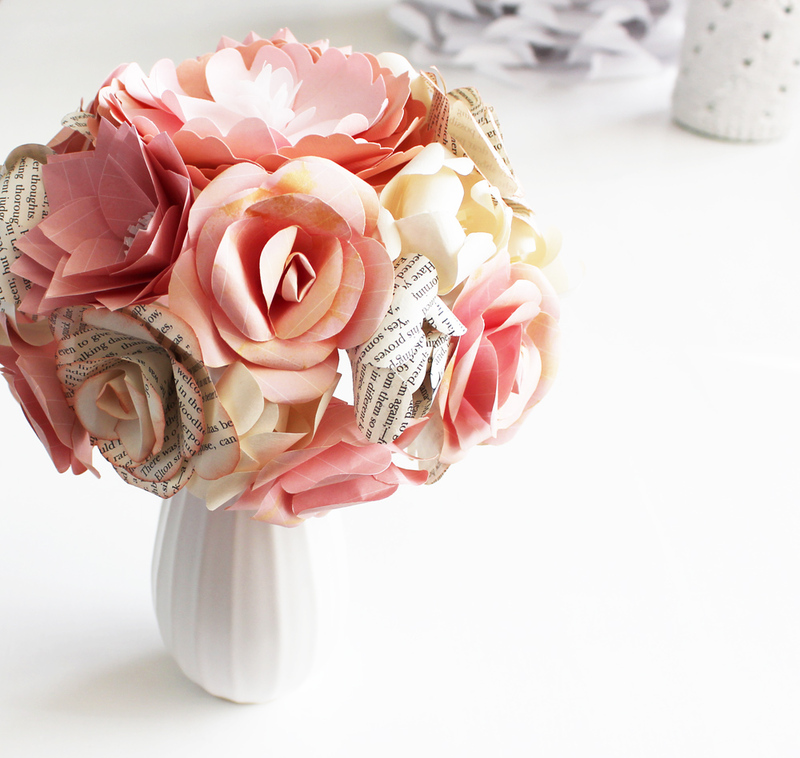 The boutonniere is part of the Pink Champagne Book Roses set and accompanies the paper bouquet I made a while ago. This color palette (pale pink, peach, cream and book paper) is so romantic and one of my favorite, and I'm so glad the bride that gets to carry these flowers down the aisle is one who appreciates handmade beauties. Wishing you all the joy in the world, Judy!